Making the decision to get married begins a new and exciting adventure in your life as a couple. Love and excitement permeate the air as you start planning the perfect day. Although the decisions surrounding a wedding seem endless, such as setting a date or picking the perfect venue, there are other important questions that need to be answered as you start your lives together. Should two people manage the money? The short answer is yes! Allowing only one person to be in control of the household finances can lead to potential disaster. You and your soon-to-be spouse should take an evening and sit down to discuss who is going to manage which aspects of the household funds. Be sure to honestly answer the “who, what, when, where and why” when it comes to both of your finances. Now is the perfect time to come clean about everything you have whether it be the amount of debt or the bonus you received last week. Take out your last bank statements and review what you have and what you owe. How will you handle the expenses? There are a few different approaches to how you can split the expenses as a couple. One option is that you can split the expenses 50/50 (which means splitting everything equally). This works the best if both partners make approximately the same amount of money. Another option is that you can split everything proportionately. For example, if one person makes $60,000 per year and the other makes only $30,000 annually, then the person with the higher income could pay 60% of the expenses and the person with the lower income would be responsible for the remaining 40% of the expenses. For this approach to work, each partner should prepare a personal budget to ensure that the expenses breakdown is realistic. The last option is to pool all your money together, then set your financial goals. When using this approach, it is highly suggested to set aside a budgeted amount so each partner can have personal indulgences. Overall, this is a great strategy to ensure you are working together towards a goal while avoiding resentment. How much personal spending money does each of you need? The truth is each spouse needs their own personal spending budget. By setting aside a personal amount that will be outside of your household budget, you avoid the resentment that will come if you need to ask your partner for money each time you want to purchase that $10 t-shirt or buy that morning coffee. Together decide on an amount that is fair and work it into your budget. You should also decide how much can be spent before you need consent from the other person. If one of you is a shop-a-holic, make the number low. If one of you is extremely frugal, negotiate a higher number. Doing this will not only eliminate the need to hide things from your partner, but it will also help to limit impulse purchases which can easily push your budget off-track. How will you cope when things get difficult? Are you prepared for the ups and downs that life will throw you? As much as you probably don’t want to think about worst case scenarios, make it a point to discuss what you would do if life throws you a lemon. Do you have a will, life insurance, disability and critical illness insurance, emergency savings, and so on? By having this conversation now, you will both be prepared for the potentially awful circumstances that life may throw at you in the future. In 2009, the Tax-Free Savings Account (TFSA) was introduced by the Canadian federal government. The TFSA is a great option to help Canadians save for long and short term financial goals and the funds can be withdrawn at any time on a tax-free basis. Unlike a Registered Retirement Savings Plan (RRSP), the TFSA is meant to help you save for any type of general savings needs as opposed to simply retirement. 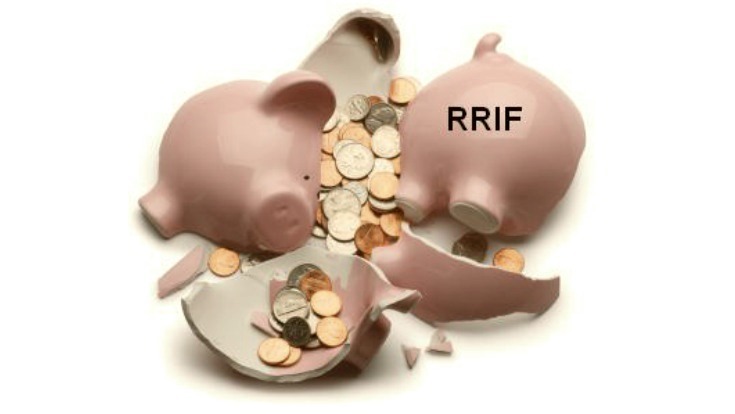 There is no penalty to withdrawing funds from your TFSA whereas withdrawing funds from an RRSP will have resulting tax implications. 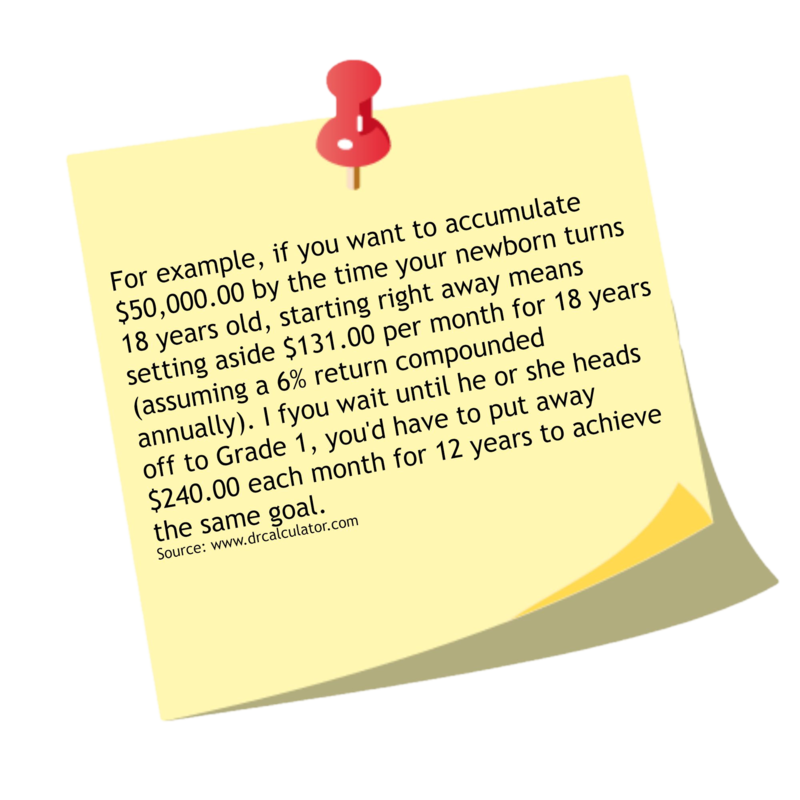 However, like an RRSP, there is an annual contribution limit. 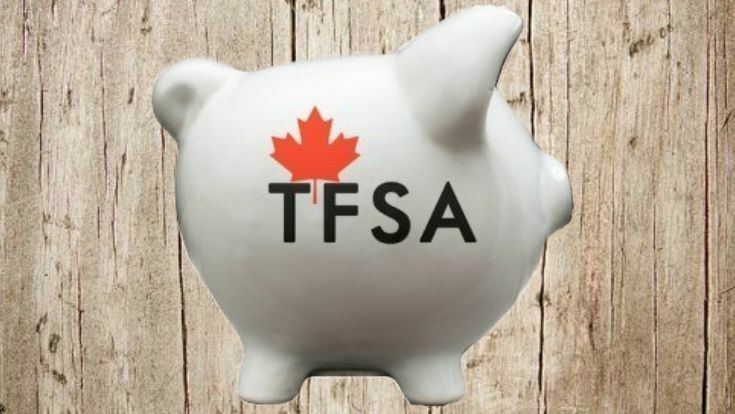 For a TFSA the annual contribution limit is not linked to your income, but rather it is set by the federal government and it is the same limit for all Canadians. Contributions are not tax-deductible, but investment returns (capital gains, interest and dividends) earned in a TFSA are not taxed, even when withdrawn. Withdrawals are tax-free and funds can be used for any purpose. Unused contribution room can be carried forward indefinitely. As well, any amount withdrawn from a TFSA can be re-contributed in a future year without requiring new contribution room. If you have never contributed to a TFSA before, the contribution limits from 2009 are cumulative. 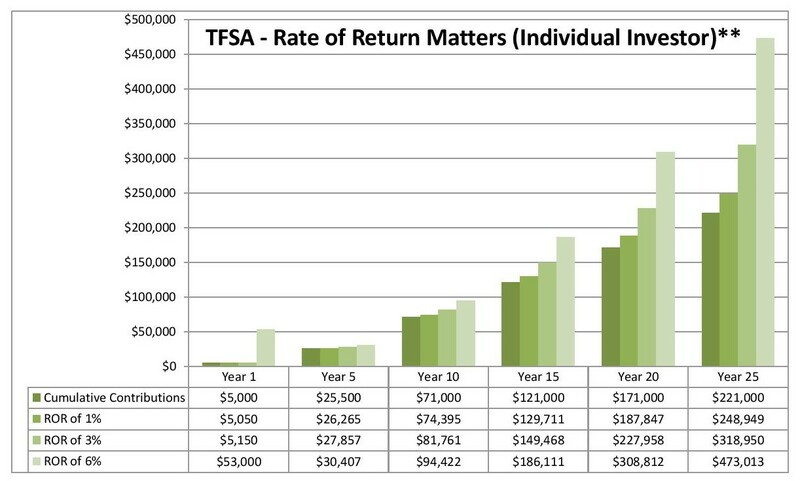 Thus, if you were to open a TFSA today you could contribute a maximum of $41,000.00, and then an additional $10,000.00 per year going forward. 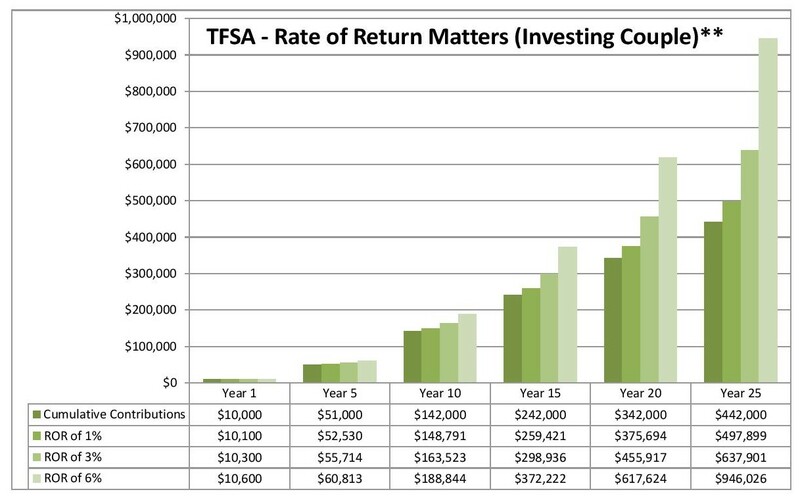 Since the funds held within a TFSA are mutual funds, the better your rate of return, the faster your savings will grow. Please refer to the below charts developed by RBC Global Asset Management for some examples as to how much your TFSA may be worth assuming the contributions are maxed out. As you can see from above, the TFSA is a great option (whether you are an individual investor or an investing couple), even if you cannot invest the maximum allowable contribution on a yearly basis. Young people just starting out: TFSAs will stimulate more savings when starting at a younger age. Seniors: TFSAs can provide retired persons with a means to save on a tax-free basis; neither withdrawals nor income earned in a TFSA will trigger clawbacks on Old Age Security (OAS) benefits or the Guaranteed Income Supplement (GIS). High Income Earners: Taxpayers who have already made the maximum contribution to their RRSPs will have another tax sheltered savings vehicle. Lower Income Earners: Taxpayers in a lower tax bracket may prefer to forgo the modest tax deduction of an RRSP in exchange for tax-free growth and withdrawals of a TFSA. In other words, the TFSA can benefits just about EVERYONE! 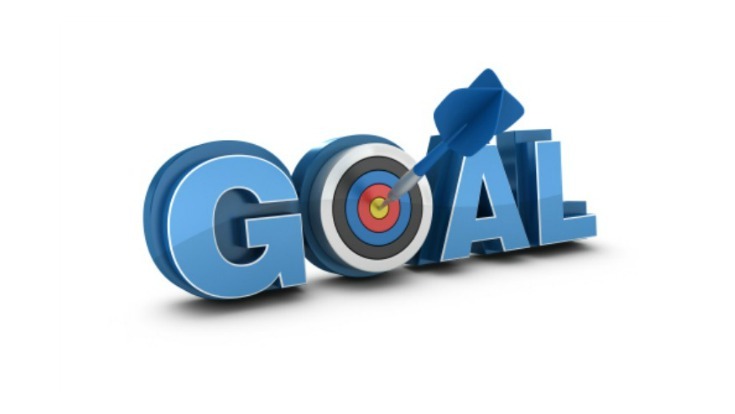 If you would like more information on TFSAs or would like to open a TFSA, please contact us. **Chart complied from RBC Global Asset Management Charts: Tax Free Savings Accounts – Rate of Return Matters (Individual Investor) & Tax Free Savings Accounts – Rate of Return Matters (Investing Couple). Did you know that now 2 out of every 3 jobs require some form of post-secondary education? College and university are more important than ever before and it is no secret that the cost of post-secondary education is rising. By planning in advance, you can make the dream of a higher education for your child, grandchild, niece, nephew or yourself possible. As with all financial goals, the best way to save for a higher education is by working with your financial advisor. Your advisor will be able to help quantify your education-savings needs, looking at the various options, in order to best develop a plan that balances your education-savings goals with your other financial priorities. Although putting off saving for education is always tempting (especially if it seems like a distant priority), but the best way to make education more affordable is to start saving right away. By starting to set money aside for education early on, you will have to save less money overall due to compound growth. According to Statistics Canada, the 2014/2015 average annual cost of tuition for a full-time student is $5,959.00. 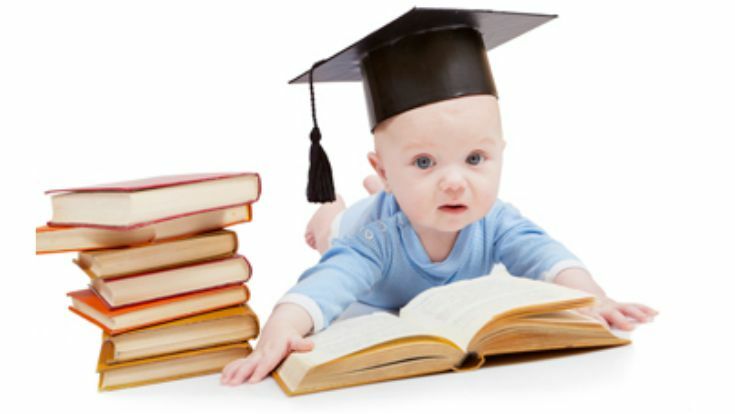 Now, if you child (or grandchild) wants to be a lawyer, pharmacist, doctor or dentist, the average annual cost of tuition can range anywhere from $10,508.00 to an astronomical $18,187.00! In order to start saving for higher education, you first need to understand what your education saving options are. Click on the link below to see a printable version of the various education savings plans options available. Accounting for the cost of tuition and related fees in your education savings plan is a great place to start; however, these fees represent only 1/3 of the expenses that students face each year! Add in accommodation, food, transportation, books and computers, and leisure, and the costs associated with higher education begins to increase substantially. Review any recommendations, address any concerns and ask questions so that you are completely comfortable before your plan is implemented. Also, remember to keep your advisor informed of any changes that could influence your plan when they happen so that you advisor can recommend the appropriate adjustments before it is too late to do anything about it. After all, always remember that a post-secondary education is not just about improving your children’s earning potential and standard of living. It also contributes to their personal growth and broadens their horizons. When you open a Manulife One account, we could lend you up to 80% of the appraised value of your home. You use this money to pay off the balance of your existing mortgage, personal lines of credit and any other outstanding debts you might have. Now you pay one low interest rate on every dollar you borrow.